The sculpture was made entirely of cardstock strips with no glue, but had the precision of something made on a 3D printer. 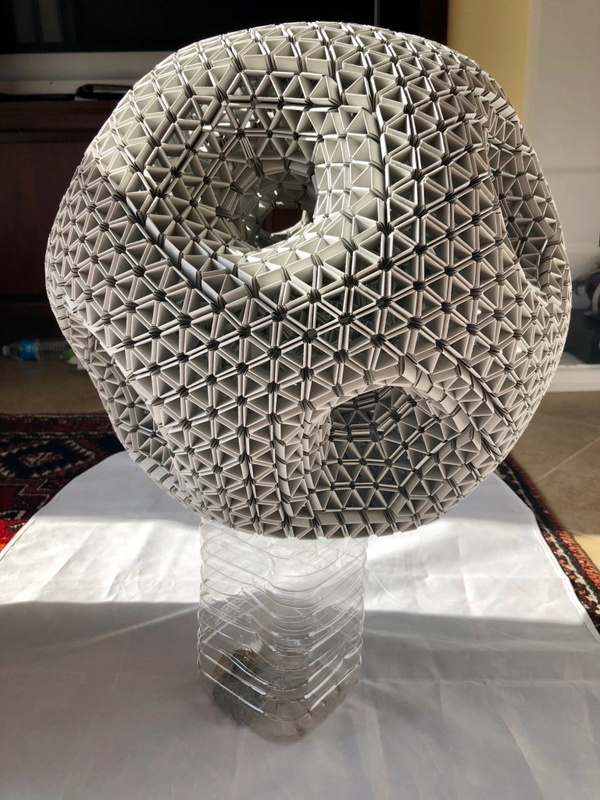 The dodecahedral symmetry of the object was quite apparent, but the topological classification of the entire surface was less obvious. 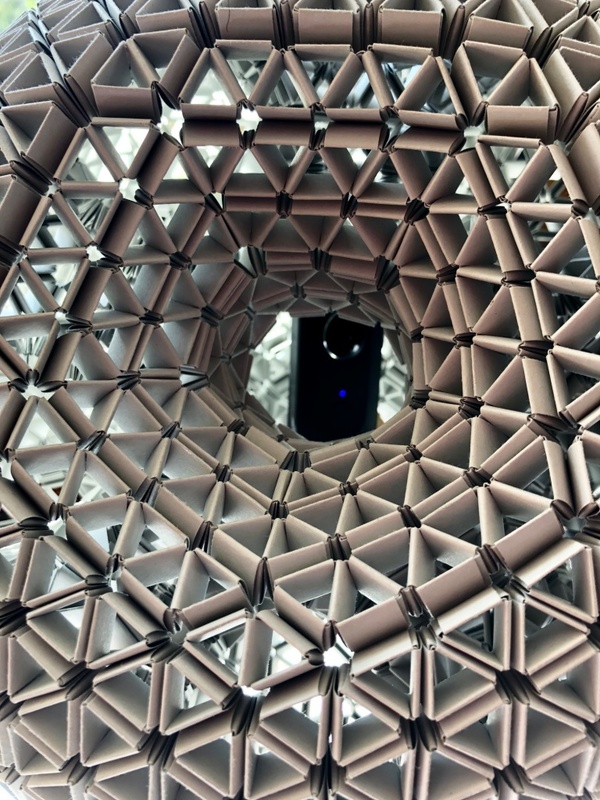 There were 12 holes on the “outside”, each corresponding to a face of a dodecahedron. Plus, there was a hole in the center, which was connected to the others. 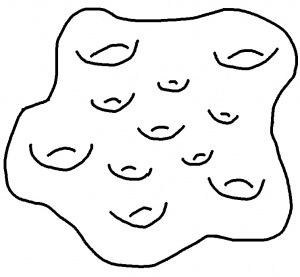 If you imagine stretching out one of the 12 “outside holes” until all the holes lie flat on a table, as in the figure below, you can count 11 holes in the middle– but this turned out to be quite an exercise in imagination, even for some seasoned mathematicians. 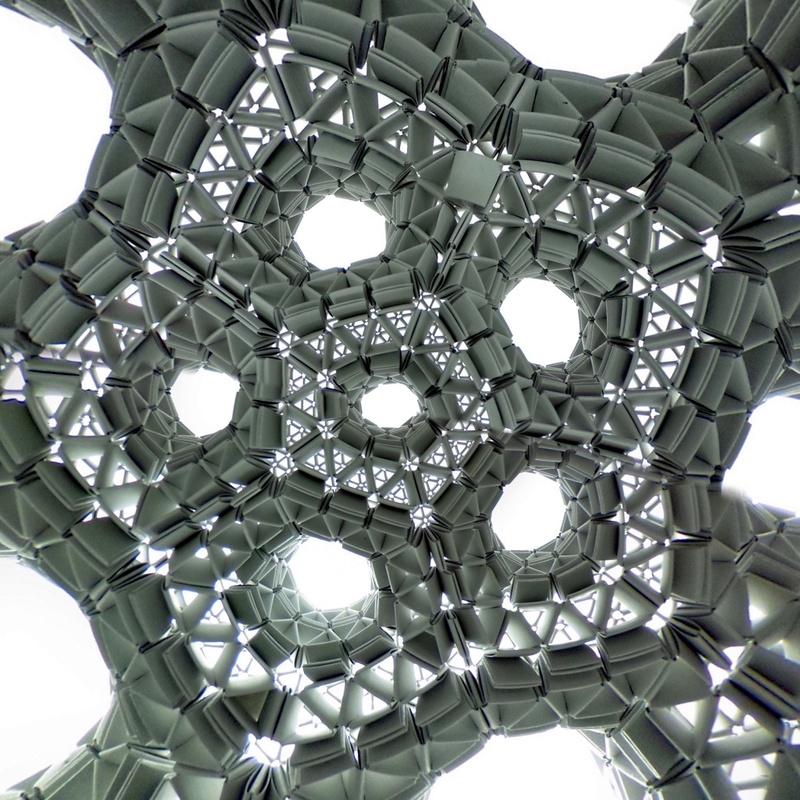 I thought that a spherical camera placed inside the dodecahedral torus would be able to tell the story better than I. I had used the Ricoh Theta S earlier to show that a cubical framework is topologically a torus with 5 holes. However, the holes of Dave’s structure were too small to fit my camera. You can explore the picture by clicking your mouse on any spot and dragging it. The dark spot is the hole in which I put the spherical camera. The camera was remotely controlled via an app on my mobile phone. The camera itself has been edited out by the processing software, but the spot is dark because light cannot reach it. Explore the 5 holes around the dark spot. When you zoom in, you will see a hole with a couple of cars in it, and another one with green hedges, and the pavement. Most of the holes are gray since it was an overcast day. In order to make a 2-dimensional print of the spherical image, one needs to choose a projection from the sphere to the plane. There are many such projections to choose from, and software packages exist which can instantly produce several types of projected images from a spherical one. The stereographic projection, which preserves angles while distorting lengths, is particularly attractive here. In the world of spherical cameras, it is called “tiny planet”. 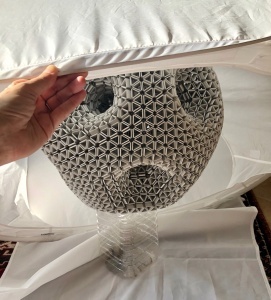 The process of creating a stereographic projection of a spherical image is beautifully explained by Paul Bourke of the University of Western Australia here. Since the dodecahedral torus can be viewed as an approximation to a sphere, the natural place to have the lens of the camera to create its spherical image is in its center. This way, the spherical image will be symmetric with respect to the 12 “faces” of the torus. However, the eye of the camera is 4 inches from the ground, while the center of the dodecahedral torus is about 7 inches from the ground. 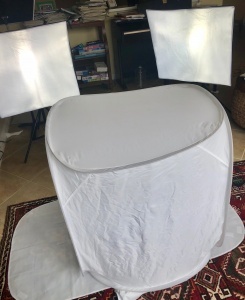 Simply elevating the camera does not give the best photographic results, since, when the torus rests on one of its “dodecahedral faces,” no light can enter through the hole in that face. 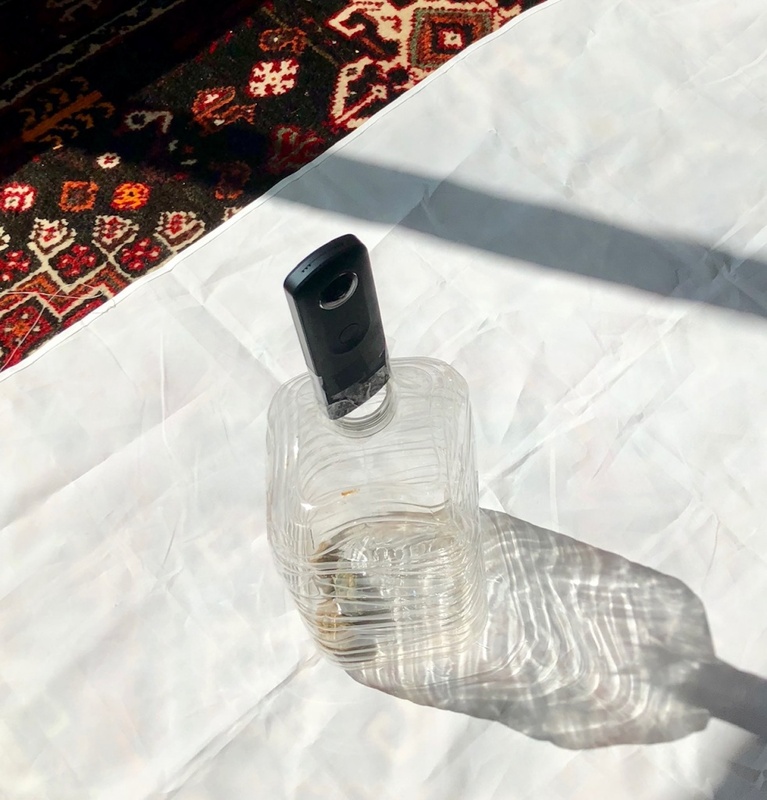 I found that the cheapest way to create a set up where the lens of the spherical camera was approximately at the center of the torus– while light could still enter from the hole in the face on which the torus was resting–was to tape the camera to a gallon plastic water bottle, as shown below. Close up view of the spherical camera inside the dodecahedral torus. Dodecahedral torus resting on top of a plastic water bottle. The spherical camera is inside the torus, hidden from view. 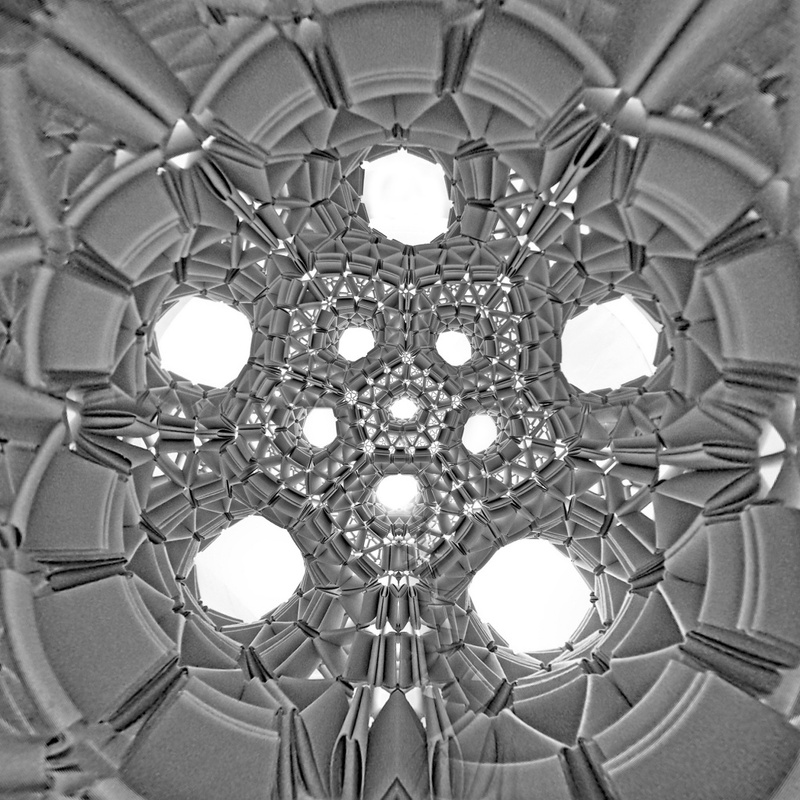 Dodecahedral torus inside the photo box, with supplementary lighting. 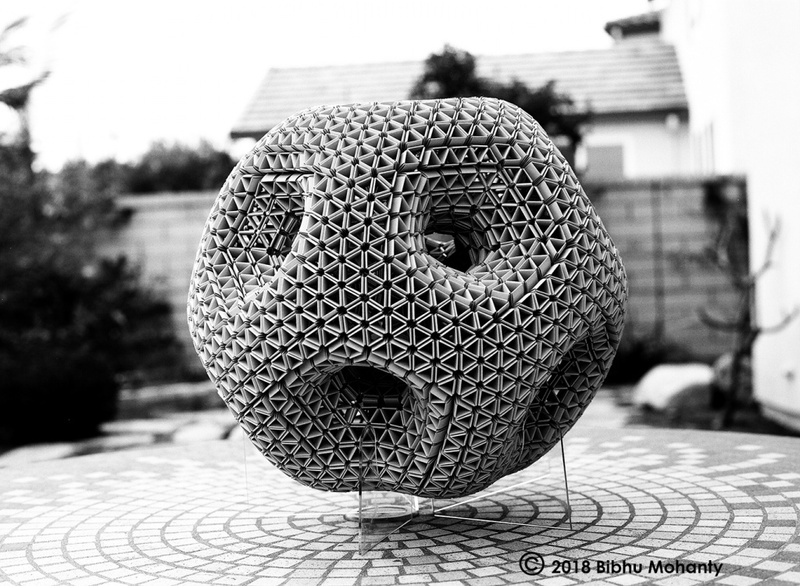 In the end I selected these two stereographic projection images, both of which show the 11 holes of the dodecahedron. This is my submission to the Bridges Exhibition of Mathematical Art at the 2019 Joint Mathematics Meetings in Baltimore. Hallowen Math: Glow in the Dark!Geometiles at CMC-S Annual Mathematics Conference in Palm Springs!